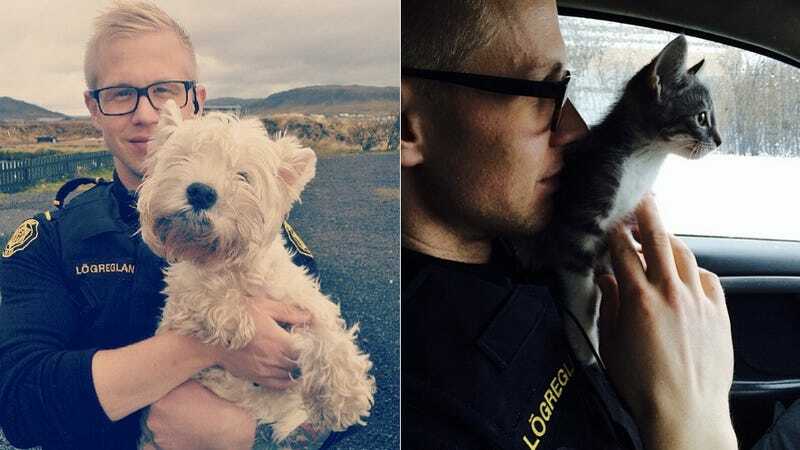 Iceland seems like a really lovely place (utter economic collapse aside), and the official Instagram account of the Reykjavík metropolitan police is doing nothing to dispel this impression. They cuddle with animals! They stop by Domino's! I guess maybe they occasionally solve crimes! This happy slice of Icelandic life was first spotted by a Redditor, who shared some choice snaps. But there's so, so much more where that came from. Scrolling through their feed you get the impression it's actually outtakes from a quirky comedy about life in a small seaside village. They do outreach to kids! They are kind to the local wildlife! Have you ever in your life seen cops this chill? There's thought to have been exactly one deadly police shooting in Iceland since the island became an independent nation in 1944.